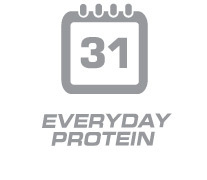 Protein to support your active lifestyle. 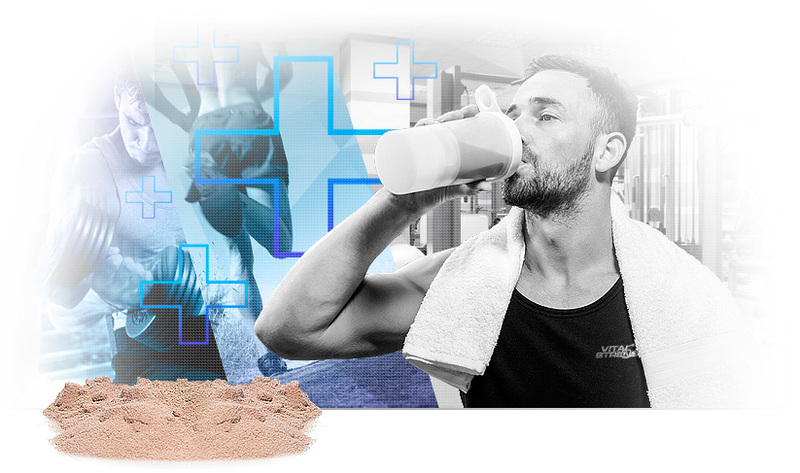 Tri-phase release protein system, including micro filtered and ultrafiltered WPI, WPC and calcium caseinate, plus scientifically selected nutrients that support an active lifestyle. 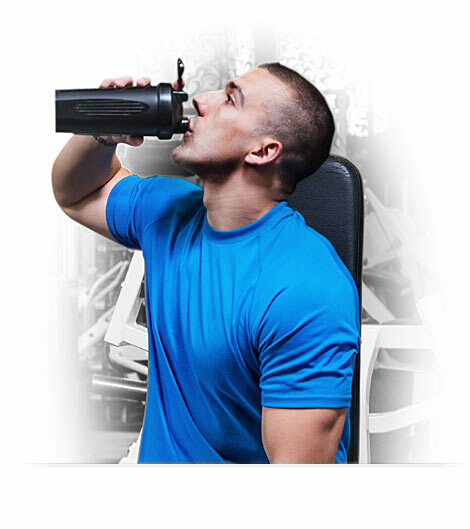 Specialised high protein blend ensures rapid absorption of muscle building amino acids to assist post-exercise recovery. Advanced refinement technology delivers high GMP and microfractions without the unwanted carbs and fats. Three high quality proteins deliver essential and branched aminos proven to assist with muscle tissue repair and recovery. No aspartame or other harsh sweeteners, delivering a taste that is just right and 100% guaranteed to satisfy. High quality nutrients including added Glutamine and Co-enzyme Q10 can help repair, strengthen and build muscle tissue. Conveniently increase dietary protein intake with this easily digested, low-carb, low-fat and nutrition-rich formula with 21 added vitamins and minerals for optimal health. Conveniently boost your daily protein intake with this all-in-one, easily digested, low carb, low fat and nutrition-rich formula. Available in mouth-watering Vanilla Ice-Cream, Chocolate Blast & Wild Strawberry. Fuel your muscles with a smooth and creamy milkshake-like flavour your taste buds won't be able to resist. 100% guaranteed to satisfy. Not all flavours available at all retails stores. 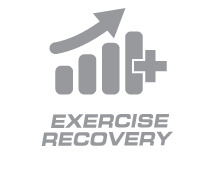 Delivers high quality nutrients before and after exercise to help repair, strengthen and build muscle tissues. TOTAL+ tastes great mixed with milk and water, and has been expertly formulated to mix easily with other foods such as yoghurt, cereals or desserts to rapidly boost protein concentrations. High Glycomacropeptides and microfractions of the proteins contribute to lasting sense of fullness to assist with appetite control. 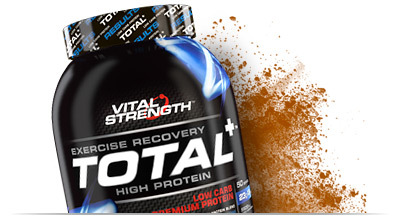 Premium protein blend expertly formulated, with no added soy proteins. 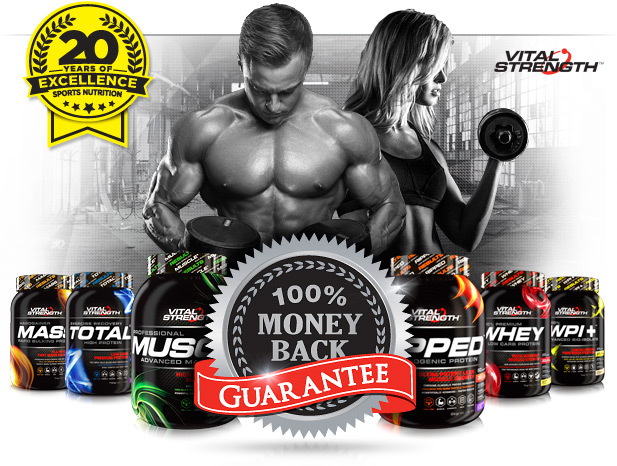 Raw ingredients and finished formulas undergo periodic testing by independent laboratories to ensure that Vitalstrength products are consistently of the highest quality and protein potency. 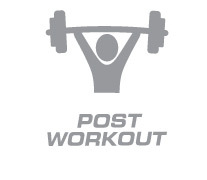 This product is formulated free from banned substances and is manufactured in an Informed Sport registered facility. Vitalstrength Protein Blend (95%) (Instantised Whey Protein Concentrate, Instantised Cross Flow Microfiltered (MF) and Ultrafiltered (UF) Whey Protein Isolate, Calcium Caseinate (contains concentrations of beta lactoglobulin, glycomacropeptide, alpha lactalbumin, immunoglobulin, bovine serum albumin), Skim Milk Powder), Flavours, Guar Gum, Glutamine, Vitamins & Minerals (Calcium Carbonate, Magnesium Oxide, Ascorbic Acid (Vit C), Iron, Zinc Lactate, Vitamin E, Sodium Molybdate, Nicotinamide (Vit B3), Chromium Chloride, Potassium Iodide, Sodium Selenite, Manganese Sulfate, Folic Acid (Vit B9), Vitamin B12, Calcium Pantothenate (Vit B5), Riboflavin (Vit B2), Vitamin A, Pyridoxine HCL (Vit B6), Biotin, Thiamine (Vit B1), Vitamin D3), Anticaking Agent (551), Sweetener (Sucralose), Coenzyme Q10. [Cocoa in Chocolate Blast flavour only. Colour (124) in Wild Strawberry flavour only]. Made in Australia from local and imported ingredients. Contains milk and soy products. Soy lecithin is used to instantise whey proteins and is less than 1% of the whey product. May contain traces of wheat, egg and cereals. If your unsure what protein you should buy this is probably what you need a great all-rounder good quality product from the trustworthy vital strength brand.. has your fast and slow proteins great taste and the aminos that you need.. Mix 30g (approx 1.5 scoops) with 250-300ml of cold milk or water. Best taken within 30 minutes of training and/or between meals. Serving size and frequency may be increased for athletes after consultation with a fitness or health care professional. 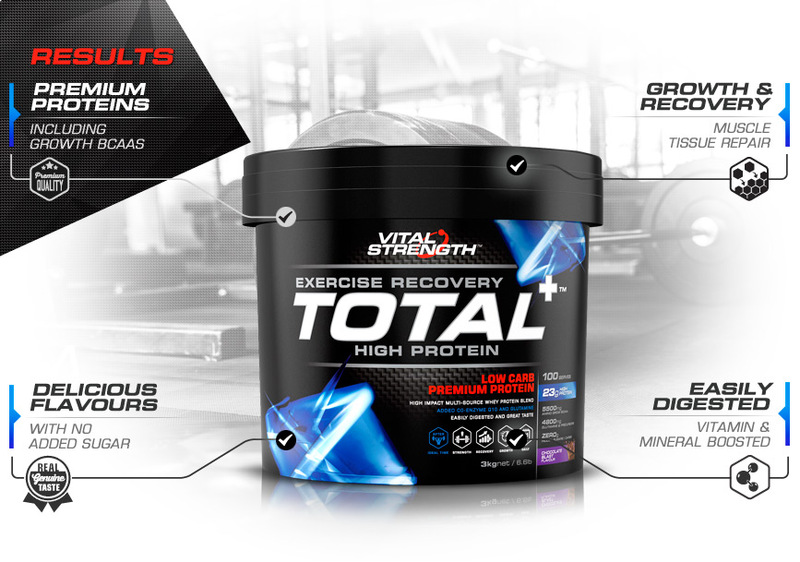 Vitalstrength Protein Blend (95%) (Instantised Whey Protein Concentrate, Instantised Cross Flow Microfiltered (MF) and Ultrafiltered (UF) Whey Protein Isolate, Calcium Caseinate (contains concentrations of beta lactoglobulin, glycomacropeptide, alpha lactalbumin, immunoglobulin, bovine serum albumin), Skim Milk Powder), Flavours, Guar Gum, Glutamine, Vitamins & Minerals (Calcium Carbonate, Magnesium Oxide, Ascorbic Acid (Vit C), Iron, Zinc Lactate, Vitamin E, Sodium Molybdate, Nicotinamide (Vit B3), Chromium Chloride, Potassium Iodide, Sodium Selenite, Manganese Sulfate, Folic Acid (Vit B9), Vitamin B12, Calcium Pantothenate (Vit B5), Riboflavin (Vit B2), Vitamin A, Pyridoxine HCL (Vit B6), Biotin, Thiamine (Vit B1), Vitamin D3), Anticaking Agent (551), Sweetener (Sucralose), Coenzyme Q10. [Cocoa in Chocolate Blast flavour only. Colour (124) in Wild Strawberry flavour only]. Made in Australia from local and imported ingredients. Contains milk and soy products. Soy lecithin is used to instantise whey proteins and is less than 1% of the whey product. May contain traces of wheat, egg and cereals.